Turkey says it will take a more active role in efforts to end the war in Syria and accepts President Bashar al-Assad as an interim but not long-term player. But announcing the Turkish policy shift, Prime Minister Binali Yildirim insisted that Mr Assad "can't have a role in Syria's future". "He is one of the actors today, whether we like it or not," Mr Yildirim said. Fighting has continued in the city of Hassakeh, where Syrian government jets have bombed Kurdish areas for two days. Hassakeh, 80km (50 miles) south of the Turkish border, is mainly controlled by the Kurdish YPG militia, but Mr Assad's government forces are trying to push them out. Turkey is staunchly opposed to Mr Assad, but is also fighting the Kurdistan Workers' Party (PKK) - an ally of the YPG. Turkey does not want the Kurds to consolidate any territorial gains that could help the PKK. A future political settlement for Syria must not include Mr Assad, the PKK or "Daesh" - the so-called Islamic State (IS) group - he said. 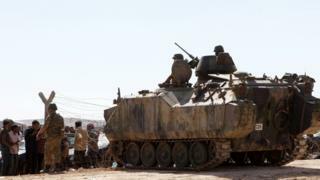 Turkey is backing rebel groups fighting to oust Mr Assad, though it has not committed regular troops to the war in Syria. Turkey is hosting about 2.7m Syrian refugees. Earlier this month Turkey patched up a bitter quarrel with Russia, whose air force is providing vital support for Mr Assad with daily air strikes against the rebels. The UN Children's Fund (Unicef) on Saturday called for urgent action to help more than 100,000 children "trapped in the horror" of Aleppo, ravaged by intense fighting and heavy air raids by Syrian government and Russian planes. The children's plight was symbolised this week by the pictures of Omran Daqneesh, an injured five-year-old boy rescued from the rubble in Aleppo. The images of him with a head wound, looking utterly bewildered and shocked, stirred international outrage. The London-based Syria Solidarity Campaign reported on Saturday that Omran's 10-year-old brother Ali had died of his injuries, after the family home was hit by a bomb. Activists in Aleppo also reported Ali's death, al-Arabiya news said. The YPG has emerged as a major fighting force in northern Syria in the past two years, becoming a key ally of the US-led coalition against IS. Kurds made up between 7% and 10% of Syria's population of 24.5 million before the uprising against President Assad began five years ago.